It’s over three decades since Paul Cook and Nigel Adkins shared a cramped dressing room at Springfield Park. Much has changed in the ensuing years – and not just in terms of hairlines and facial fuzz. 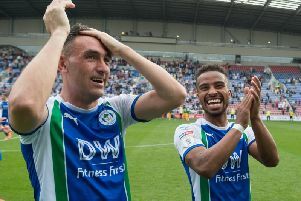 But the pair will be back together tonight, sharing a technical area, as Wigan Athletic aim to kick away from the relegation dogfight, and Hull City continue their play-off push. Two managers fiercely determined to see their teams over the line. Two men who perhaps wouldn’t have appeared the most obvious management material back then. “I always loved football, although I wouldn’t say I always had myself down as a manager,” Cook told the Wigan Post. “A job in football, yes I always thought that would something I would pursue. “Nigel initially went down the physiotherapy route, and probably found himself managing as ‘needs-must’ rather than by plan. “Obviously the rest of the story is there for everyone to see, he’s made a very successful career for himself as a manager. “People say if you find something you love, you’re very lucky – and I’m no different. “I still love football as much as ever, I still watch it as much as possible. Cook has achieved much in his career, both as a player and manager, but it’s clear how much his grounding as a youngster with Latics means to him. “We were talking about it only the other day, funnily enough, the old days at Springfield Park,” he reminisced. “The character of the place... the old pie shop on the corner where we used to get our dinner... the social club...everything. “It was a world apart from the academy system we have these days, but we all enjoyed it! “Cars were travelling in from Liverpool with four or five lads, the same coming in from Manchester. “Wigan was just a great club to play for, they gave young players a chance they might not have got elsewhere. Cook is also full of admiration for the job his old mate is doing on Humberside. “When we beat Hull at home early in the season, the majority of the people in the stadium would have gone home thinking they were in for a relegation battle,” Cook added. “From then on, what a job he’s done....I would love to know how many points they’ve taken since the first 10 games. “It would probably be enough to see them comfortably in the play-offs.